Morus alba L. (Fam. Moraceae). Botanical Name: Morus alba L. (Fam. Moraceae). Part Used & Method for Pharmaceutical Preparations: The leaves are gathered in autumn, during the period of Frost's Descent (eighteenth solar term), then dried in the sun. Properties & Taste: Sweet, bitter and cold. Functions: 1. To expel wind and clear heat; 2. To clear heat in the liver and benefit the eyes. 1. Wind-heat exterior syndrome manifested as fever, headache, sore throat and cough. Mulberry leaf (Sangye) is used with Chrysanthemum flower (Juhua), Platycodon root (Jiegeng), Mentha (Bohe) and Forsythia fruit (Lianqiao) in the formula Sang Ju Yin. 2. Lung attacked by dryness and heat manifested as cough with sputum and dry nose and mouth. Mulberry leaf (Sangye) is used with Apricot seed (Xingren), Tendrilled fritillary bulb (Chuanbeimu) and Ophiopogon root (Maidong) in the formula Sang Xing Tang. 3. Deficient yin of the liver manifested as dizziness and blurred vision. 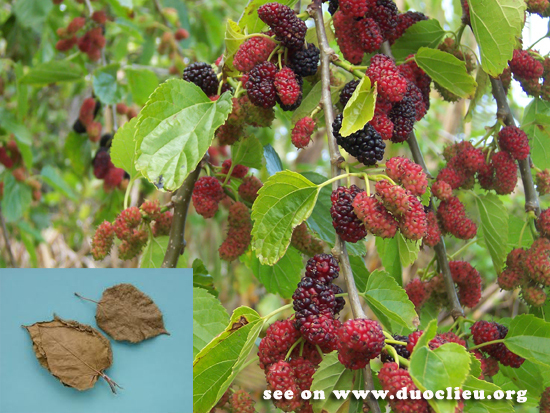 Mulberry leaf (Sangye) is used with Ligustrum (Nuzhenzi), Wolfberry fruit (Gouqizi) and Black sesame seed (Heizhima). 4. Flaring up of fire in the liver manifested as red, painful and watering eyes. Mulberry leaf (Sangye) is used with Chrysanthemum flower (Juhua), Cassia seed (Juemingzi) and Plantain seed (Cheqianzi). Dosage: 5-10 g, decocted in water for an oral dose.